The Standing Committee on Agriculture in Parliament unequivocally concluded that GM seeds and foods are dangerous to human, animal and environmental health and directed the former Government of Manmohan Singh to ban GMOs . Despite such evidence and the recommendations to put a hold on open field GM trials by the Supreme Court-appointed Technical Expert Committee, the push is on within official circles to give such trials the green light. GRAIN found that around 56 percent of Russia’s agricultural output comes from family farms which occupy less than 9 percent of arable land. Russia does not need or want GM crops, which the Russian Prime Minister has described as amounting to little more than a form of biological warfare weapon . And here lies the real heart of the matter. Former US Secretary of State Henry Kissinger once said that if you control oil you control nations, but if you control food you control people. GMOs are not needed to feed the world. Science cannot justify their use. They are a weapon. Russia is correct to conflate bio-terror and GMOs. The oil-rich Rockefeller family set out to control global agriculture via the petrochemical-dependent ‘green revolution’. The destruction of traditional farmer-controlled agriculture was actively supported by the US government and its Trojan horse agritech corporations under the agenda set out by Kissinger. GMOs now represent the ultimate stranglehold over food via ‘terminator’ seed technology, seed patenting and intellectual property rights. Moreover, the Rockefeller Foundation and the Gates Foundation – which have teamed up with Monsanto in Africa – have long-standing concerns about overpopulation in ‘third world’ countries and how they could develop and threaten resources that the West has used to enrich itself with . In fact, Monsanto now own the Epicyte gene, which causes sterility. What will be the ‘final solution’ for the likes of 600 million in India or millions in Africa or elsewhere who are to be removed from agriculture ? The eugenicists are knocking at the door. Despite compliant politicians and officials in high places who seem hellbent on capitulating to Monsanto and the US, many recognise the dangers associated with GMOs and are working hard to resist their introduction. 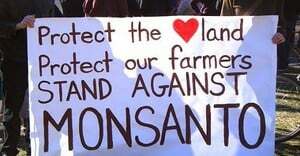 However, they are attacked and accused of slowing down growth because of their resistance to GMOs . Certain activists and civil organisations are also accused of working against the national interest by colluding with foreign interests to undermine ‘development’. The hypocrisy is blindingly obvious: the state itself has for a long time been colluding with foreign interests to undermine the basis of traditional agriculture. “It is fitting that at this solemn moment we take the pledge of dedication to the service of India and her people and to the still larger cause of humanity… The achievement we celebrate today is but a step, an opening of opportunity, to the greater triumphs and achievements that await us. Are we brave enough and wise enough to grasp this opportunity and accept the challenge of the future?… A new star rises, the star of freedom in the east, a new hope comes into being, a vision long cherished materialises. May the star never set and that hope never be betrayed!” Jawaharlal Nehru from his “tryst with destiny” speech at Parliament House in New Delhi in 1947.